Our choice of BMWs gives both motorcycle rider and pillion a comfortable day's ride out. 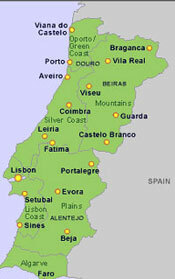 With this in mind, we offer a selection of on road tours in Central Portugal which include places of interest. Listed below are just some ideas for a ride out but other tours are available and all tours can be tailored to suit your choice of places to go and sights to see. A day's tour to the coastal region of Costa da Prata including lunch in the charming town of Costa Nova, south of Aveiro. The traditional houses (Palheiros) originally provided shelter for colonies of fishermen and their fishing equipment. When it became fashionable to bathe in the sea, towards the end of the 19th century, the local fishermen began to rent out their palheiros in the summer season. It was at this time that they began to paint the outside panels of these wooden houses in bright colours which gives this town a brightly-coloured, candy-striped unique appearance. 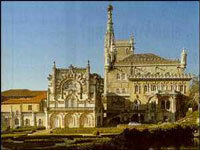 A day's tour to Tomar Castle and the Convent of the Knights of Christ. In the 1100's the Knights Templars, were given refuge in Portugal in exchange for helping the Portuguese to expel the Moors. It was at Tomar that the Templars began constructing their first Portuguese stronghold in 1160. A day's tour to Serra do Caramulo and Bucaco Palace at Luso. As with any tour in this region, you will enjoy spectacular mountain views. Caramulo is said to have some of the purest mountain air in Portugal and during the 1930s the town had no less than eighteen sanatoriums. Caramulo has a museum dedicated to modern art and vintage cars and motorcycles.